For each one of us who bump up against days that seem cold and blustery, dark and discouraging, difficult and dreary, there is always a memory that will brighten those moments. That memory is from somewhere back in the days of childhood, when a simple story of a bear named Pooh, dressed in a red shirt, made us smile. 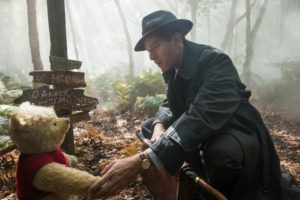 When Christopher Robin jumped from the pages of the famous 1926 A.A. Milne book, Winnie the Pooh, to the big screen, it was a coming-home event for all Pooh lovers. The story begins where the book The House at Pooh Corner has left off. Christopher Robin (played by Ewan McGregor), says his fond farewells to his wonderful Pooh (voiced by Jim Cummings) playmates and makes his way to boarding school. As he grows up, we watch him serve in a war, marry his wife, Evelyn, and have a daughter, Madeline. We eventually discover that Christopher is lost in a world of business. He’s lost his sense of direction, family, and priorities. He’s misguided by a selfish boss and is struggling with his family life. As his wife and daughter seek solace at the old country house, Christopher stays behind to work. Alone and struggling, live action-computerized Pooh, comes to the rescue by arriving at Christopher’s house in London. The bear from Christopher’s childhood spreads cheer by spilling honey, donning a pair of pajamas and taking a quick nap before encouraging Christopher to go back and help find the lost Pooh-friends. The movie flooded us with hope as we cheered on Pooh hoping that once again the matched-up friendship of Christopher and stuffed bear would produce happiness. Headed off to the countryside to help Pooh, Christopher Robin discovers that his life is completely overtaken with work and he is the one who is lost. He realizes through Pooh’s simplistic lessons, that he guards his briefcase filled with “Very Important Things,” more than he values his wife and daughter. The Bottom Line: The movie Christopher Robin is heartwarming, enjoyable, and family-friendly. Life lessons were scattered throughout, and one can ever have enough Winnie the Pooh stories that promote teamwork, compassion and imagination.